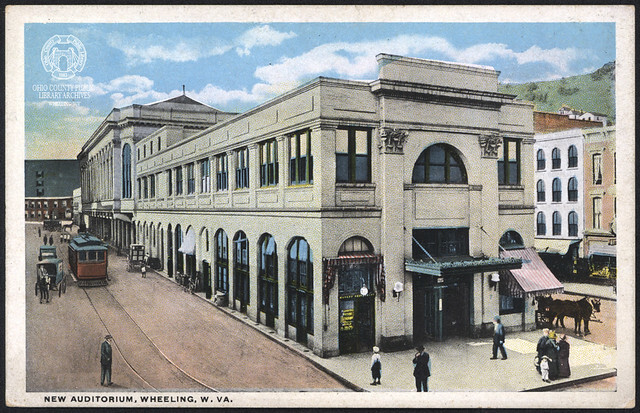 The Market Auditorium, located on Market Street spanning the space from 10th to 11th Street, replaced the old 2nd Ward Market House, which was razed in 1911. -from "Program for the Opening and Dedication of the Market Auditorium Building to be Held on the Evening of Friday, May the Second, Nineteen Hundred and Thirteen," 1913. THE CONSTRUCTION of an auditorium was first taken up by the Board of Trade at the suggestion of President George W. Lutz. The subject was referred to a committee with President Lutz as chairman and Secretary R. B. Naylor as secretary. A suggestion by Mr. Lutz that two ends could be served by the erection of a new market with a spacious auditorium on the site of the old Second ward market was adopted. Architect F. F. Faris designed the structure. An ordinance was framed providing for the formation of a company by the Board of Trade which should lease the site from the city at a nominal rental and erect the building at an approximate cost of $160,000. The ordinance was passed March 28, 1911. After a few weeks' work in which Mr. Lutz, W. E. Stone and Secretary Naylor took the leading part, subscriptions amounting to $160,000 were secured from 162 individuals and companies. A charter was granted April 21st and on May 1st the Market-Auditorium Company was formed and directors elected. The City of Wheeling is represented by three directors. On September 14th, the contract was let to B. F. Perkins and Thos. W. Jackson. The cornerstone was laid on April 25th, 1912, and the building practically completed last January. The building, which is the largest and most beautiful in the State, is constructed of vitrified brick and structural steel, is 506 feet long and 40 feet wide at the ends. The Auditorium is 52x180 feet and will accommodate 3,500 people. The market section has 64 stalls which are all rented and a daily market will be held. There are 23 spaces fronting streets where farmers can sell from wagons. The second floor contains office rooms, occupied by the Board of Trade, Business Men's Association, Retail Grocers' Association and the Municipal League. An ordinance to raze the auditorium was passed in 1961. It was demolished in 1964. ▶ West side of Market Street from 10th to 11th Streets (demolished, now Market Plaza Park). ▶ Vertical File: Market Auditorium, Wheeling Room, non-circulating, ask for access at the reference desk.